This full day excursion will introduce you to the most famous landmarks of the city. After a 15 minutes drive, the first stop is scheduled to the Topkapi Palace , the home of the sultans who commanded the Ottoman Empire. The palace is a complex of structures surrounded by walls and located on the edge of the Bosporus River. It is now used as a museum exhibiting Islamic and Ottoman artefacts, including the Topkapi Diamond. 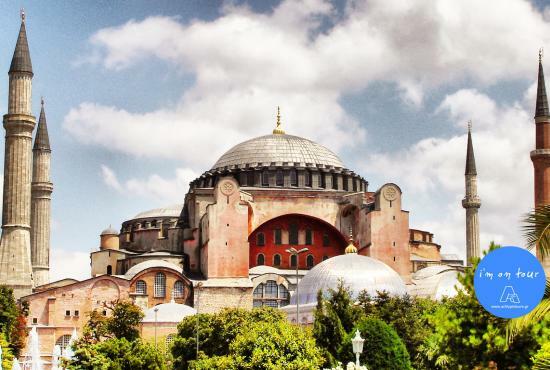 The next stop is Hagia Sophia , the most magnificent Byzantine temple built by the emperor Ioustinianos and decorated with marbles from Ephesus. It is considered the epitome of Byzantine architecture. As you leave behind Hagia Sophia, you will visit Blue Mosque which own its name to the interior decoration of 20,000 blue tiles. The mosque is crowned by six exterior minarets of 64 meters. The sightseeing goes on to the Hippodrome, built by the Byzantines to host horse races. It became later a social and sports centre of the Ottoman times. Among the remainings of the Hippodrome, you will see well-preserved obelisks. After your educational tour , you can treat yourself with free time in Grand Bazaar to explore the numerous products of the market ,such as carpets, silk cloths, porcelain and wooden hand made decorative items.